Dogs hear high tones in particular much better than humans do and cats have incredible hearing skills. In fact, Cats can hear sounds that even dogs fail to hear. With 2 satellite dish shaped ears, cats’ range of hearing goes up to ultrasonic which is superbly high. Compared to cats and dogs, humans are totally out of their league. Ear infections in dogs and cats are a common health problem for many pets and often seen in vet clinics. After the sense of smell, the ability to hear is the next most important of special senses. Ears are really great places for problems to occur. Normally your furry friend’s ears should look and smell clean. Also, they should be free of wax and dry skin and there should be no loss of hair or redness of the skin. Genetics, individual anatomy, underlying diseases (think of allergies) and lifestyle activities (swimming!) play a role in predisposing your pooch to ear trouble. We have seen Archie & Bonnie who both had bad ear infections and both are doing fine now. For Archie Dr Kathrin suggested general anesthesia which allowed us to further assess the ear canals and inner ear via radiography and to collect additional samples, confirm our diagnosis and to thoroughly clean the entire ear canal without pain to the patient. Archie happily snoozed through his procedure and the additional information we gained allowed us to tailor his medications to achieve resolution. Providing the best treatment plan depends on finding out what is causing the problem so it is important to be able to look down into the ear canal with an otoscope. Any evidence of parasites like mites which can inhabit the canal? Swollen ear canal skin, red, painful as might happen with allergies? Discharge that suggests yeast infection or bacterial population? Is there a foreign body like grass awns or wax/hair plugs which may be obstructing the ear canal? Is there a growth or polyp in the ear? Are there other health issues that may also be affecting the ear like a rupture ear drum? Some ear problems like grass awns may be quite evident, yet other ear issues require sampling of the ear debris. Looking under the microscope for evidence of mites, abnormal cells, bacteria, or yeast and some infections require cultures to select the correct antibiotic medication. To help keep your fury friends ears healthy please get in the habit of looking at the inside of your dog’s or cat’s ears on a regular basis. The earlier you discover a problem the sooner it can be addressed. If your dog swims regularly, has a history of allergies, or has been diagnosed with ear infections in the past – pay particularly close attention to their ears as repeat infections can happen. Make sure your dog’s ears have a chance to dry after swimming (sometimes drying them might be necessary!). Look for signs of an ear infection or issue such as head shaking, excessive scratching or rubbing, redness, odor, discharge, swelling, or evidence of pain. A hairless patch on the outside of the ear pinnae is sometimes the only indication your cat has itchy ears and is scratching frequently. 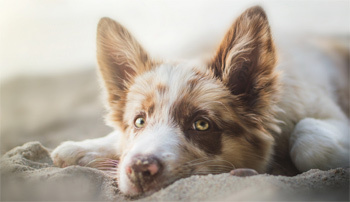 If you have any questions or concerns about your pet’s health or ear infections in particular please call us at Ellerslie Veterinary Clinic – we are here to help.